Calling all entrepreneurs! Get ready for Vator Splash LA! Win the chance to present on stage at Splash LA on the evening of May 30, in front of some 350 business professionals, comprising of executives from startups and large companies, angel investors, VCs, and media. Also win a chance to meet with top-tier VCs. The Splash winner receives one-hour sit-down meetings with Javelin Venture Partners, Rustic Canyon Partners, DFJ, CrossCut Ventures and more. 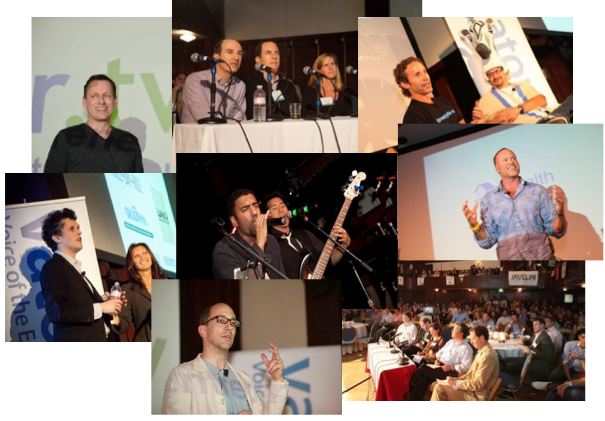 To win the VC sit-down prize, you must "at least" be one of the top 10 hot startups to showcase at the event. Among other prizes include services and products from KPMG and Wilson Sonsini and Apple. The top 10 receive $24,000 in free services from Rackspace, our Champagne sponsor, plus free services and products from Backops, and Manifesto Wine. To be one of the top 10, you have to apply to this competition and be vetted by judges. To qualify you must be under three years old, and have raised no more than $2 million in funding. "Having the opportunity to demonstrate Apartment List at Vator Splash and talk about our vision to an audience of top-tier VC investors and entrepreneurs was an exciting honor. Bambi and team put on an great night of Silicon Valley networking. We made meaningful connections at Splash as well as on Vator that are proving fruitful for our business, and winning the start up competition was icing on the cake. Thanks Bambi and team for creating a great investor and entrepreneur community and packing the house with a fantastic audience at your events,"John Kobs, CEO and co-founder of Apartment List. What do the top 10 finalists win? The opportunity to give a three-minute presentation onstage. A professional video of their presentation produced by Vator. A free ticket to the event, and discounted tickets for their network. Discounted tickets for future Vator events. A bottle of wine. $24,000 of services from Rackspace. Free back-office consultation and work courtesy Backops. The Splash winner (voted by judges) and People's Choice winner (voted by the audience) get: Same as top 10, a magnum of wine, courtesy Manifesto; a demo table at the next Splash event; Discounts to Vator events; opportunity to be an online judge for the next Splash; sit-down meetings with top VCs (Javelin Venture Partners, DFJ, Rustic Canyon Partners, CrossCut Ventures); two hours accounting consultation, courtesy KPMG; one-hour corporate, one-hour IP consultation, courtesy Wilson Sonsini. The Splash winner also wins an Apple iPad Mini. Startups must be three years old or under. Start-ups must not have raised more than $2 million in funding. Start-ups must apply with a company profile on Vator. Startups must be three years old or under. Start-ups must not have raised more than $2 million in funding. Startups must apply with a company profile on Vator. Participants have to have finished in the top 18 of the first round. Ethan is Executive Director, Global Business Development at Warner Bros, and one of the program directors of Media Camp, the studio’s media-focused accelerator. He is responsible for identifying how emerging technologies will radically change the way consumers experience entertainment content, and the new business models that will facilitate those consumer shifts. Ethan has done extensive work in the area of innovation and facilitation as a catalyst for growth; this includes internal innovation initiatives targeting new processes to enable quicker ideation, prototyping, and launching of ideas to market, as well as external partnerships allowing for innovation through collaboration (through partnerships, JVs, commercial deals, and direct investments/accelerator models). He has a history of success in building and launching new business models and products to the market. Serial entrepreneur and co-founder of Cross Campus. Located in Santa Monica, Cross Campus is an engine of creativity and innovation serving as the hub of entrepreneurship in Silicon Beach. Corporate partner at WSGR serving the start-up and entrepreneurial community since 2000. A serial entrepreneur in retail, telcom, design/printing, cellular, tech, Internet community development & CEO/COO over companies in publications, telcom, enterprise mgmt systems, pr, & fundraising. Graham is a Senior Marketing Manager at Rackspace and manages the Rackspace Startup Program. He received his BA and MBA from The University of Texas at Austin and has been working with startups at Rackspace for over 2 years. Prior to Rackspace, he worked as a product manager for an Austin-based startup. Rackspace® Hosting (NYSE: RAX) is the open cloud company, delivering open technologies and powering more than 205,000 customers worldwide. Rackspace provides its renowned Fanatical Support® across a broad portfolio of IT products, including Public Cloud, Private Cloud, Hybrid Hosting and Dedicated Hosting. The Rackspace Startup program was launched in March 2011 and is dedicated to helping startups succeed. Through the program, Rackspace offers hosting, mentorship, promotional opportunities and more to technology startups. Its Fanatical Support® serves as an additional team member for startups, allowing the rest of the team to focus on growing the business. And its broad product suite built on OpenStack is robust enough to handle nearly infinite growth while never locking in customers to a single vendor with proprietary technology. For more information, visit www.rackspace.com. I was co-founder and CEO of Yardbarker, the largest network of sports blogs on the web. I now run Digital for Fox Sports, overseeing product development, content production, and audience development.